In keeping with the weather brought by the #beastfromtheeast, the featured image is of the only Scottish beast which can truly withstand freezing temperatures. 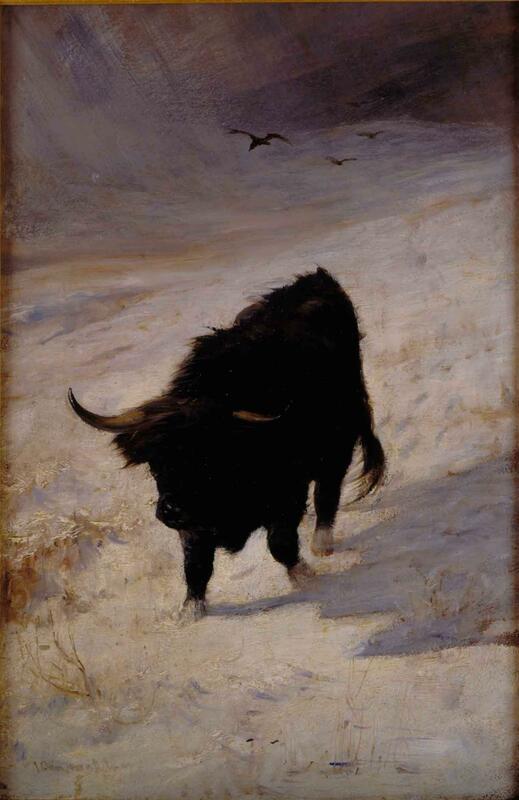 ‘Black Beast Wanderer’ is the title of Joseph Denovan Adam’s study of a solitary highland cow, caught up in a snow storm. Adam (1842 – 1896) ran a school of animal art at Craigmill in the 1890s. The small black highland cattle or ‘kyloe’ were the native cattle of Scotland, and the economy of the Scottish Highlands depended upon them. They could feed on rough, poor or even marshy ground and could withstand the most severe winters. Even today, they are the sole breed which can remain out of doors in the icy winters of Sweden; all other breeds require to be sheltered. Once a year, the cattle were taken to market in autumn along the drove roads by the cattle drovers from all parts of the highlands and islands, to the cattle trysts or sales in Doune, Stirling and on Stenhousemuir, Falkirk. The cattle were moved at the rate of about 30 miles a day, to maintain optimum weight and condition. The droving trade came to an end with the advent of the railways in the 1840s, but Stirling’s central geographical location and its historical connections with the trade are the reasons the city has two livestock marts today – United Auctions and Caledonian Marts.